Another week and another biased anti-streetcar headline from the Enquirer. Here is the latest article: City threatens Duke over streetcar costs. No where in the article does it say the City threatened Duke Energy. It states the City is “investigating potential legal remedy.” It also says that the City's inability to reach an agreement "threatens to pose significant cost risk" to the project. It does not say the City is Threatening Duke Energy. The word threat is a bias created by someone at the Enquirer. I'd like to know who wrote it. Headline writing is much talked about and usually creates a frenzied finger pointing effort. Reporters point to Editors. Editors are mum or point to someone else. In this changed internet age, I have to ask, does a reporter submit a story without a title/headline? On most blogging software you have to have a title to the story when you post it, even in draft form. Is that what the Enquirer does? Does the reporter include a headline along with the story when submitted and it then is modified by a copy-editor, content-editor, or layout designer? Did the word "Threatens" start with Horstman or was it added after? No one will likely ever take blame (or would it be credit?) for the misuse of the word. We just have live with the bias, but we can and must call them out when they fail to present the truth to their readers. Not sure what is burning, but it appears to NOT be a small fire. 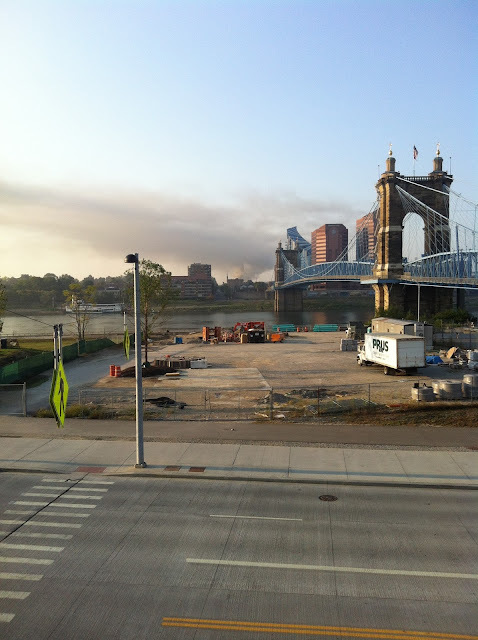 The smell of smoke and burnt material is strong at Smale Park, but the fire appears to be at least a mile away. It would appear that Cincinnati City Council Member Charlie Winburn likes to lie. Yes, that comes as news to no one who has been following Cincinnati Politics any time over the last ten years, but this time it is a whopper. Winburn lied to someone about running for mayor. The only question is did he lie to the Business Courier this year or did he lie to the Cincinnati Enquirer back in 2010? Yes, it is fully possible he lied to both, but either way, he is being deceitful. He has broken a commandment. He is also toying with the idea that he could win. He obviously is delusional. I don't know if he thinks that Republicans will give him a ton of money and then convince all of the Republicans to ignore race, since they clearly did that in 2010. He also must assume that more blacks will vote on nothing but race and ignore the fact that he's a Republican. I made it clear that I would not let him forget this when he said it. I am glad Quimbob has similar questions for Winburn. I hope everyone asks Winburn via email or social media when he was lying, now or then? Outraged Conservatives, Come to Findlay Market to Support Your Comrade! I really hope all of the conservatives who are voicing outrage over a Findlay Market shop owner's hyperbolic anger about having her store included in a commercial for President Obama's, all come down to the Market! Please be sure to park in the many Findlay Market parking lots, they are priced ver reasonably. Be sure to pick up some produce, meats, coffee, sweets, and much more from the many fine vendors!Yes, conservatives, this shop is located in OTR and you will have walk at least a block near poor poeple, so be warned! I expect to see a line like Chick-Fil-A.In all seriousness, why did the owner of Krause's have to be such a jerk about the Commercial? She should know better than to let her store manager sign documents. Instead of going to the press about this, she could have just let it go quietly. Instead, she allowed this to build up the ignorance on the Enquirer's website. Way to annoy your neighbors! I understand that the Cincinnati Enquirer is changing to a tabloid size print edition, but when are they changing their name to the Cincinnati Inquirer? They might as well do that if they are going to print crap like this story about Council member Chris Seelbach. To top it off, they got a quote from Mark Miller. Seriously, the lone guy who allegedly lives in Hyde Park from COAST is a relevant source for this story? How? Please, someone tell me what caused the reporter to reach into a big pile of irrelevant sources and pulled out Mark Miller's name. If the Enquirer wants to play the tawdrily game it is playing, I hope they asked Miller where he was Monday Night. Instead they gave a political foe of Seelbach the chance to gloat and make fun of him for being the victim of a crime. That sounds like the COAST I know, too bad the Report is either ignorant of COAST or shares the desire to allow COAST's gossip to make it to print. His point wasn't even valid, he was comparing this to Laketa Cole incident where she was with a person being ticketed. Seelbach was clearly the victim of a crime, he did nothing wrong. Miller is trying to damage him and the Enqurier, and the reporters, let him take a shot. There didn't appear to be an editor around to stop this either. Also, why did they story include a sentence that mentioned where Miller lived? They quoted another people, but didn't state where they lived. What was the relevance? Is it actually true that he lives in Hyde Park? Finally, they Enquirer again created another false equivalency. The only way to find any sense in this story is to view it as reporting an online flame war. The Enquirer got juicey quotes from both political sides and falsely feels they reported a fair and balanced story. The problem is that this isn't a political story. This is a crime story. Why not write about the crime? Write about what the police know or don't know. We don't need to have stories about Facebook comments. We really could use some news stories that would require the reporters to leave the newsroom. Yes, you know who butters the Enquirer's bread, that would be the shrinking readership who are a majority conservative. The over-coverage of yesterday's Chick-Fil-A still avoid the fact that the LOCAL Chick-Fil-A Restaurants in West Chester and Deerfield Township sponsered a CCV event. Yes, CCV is the anti-gay rights group that fought for Article XII and against its repleal as well as lead the charge in the anti-gay rights anti-gay marriage ban that passed in Ohio. How does this not make the story? Why doesn't the Enquirer report this? Why are they making this boycott about free speech? That's not what this is about, this is about the corporate actions of a company, not just the private views of the owners. That contradicts the rants of conservatives, who want this to be about liberals being "anti-Christian."